The year is 2092 and Earth is slowly dying, but Trevor and Saya are holding their own. They have steady work in Seattle and unlike ninety-nine percent of the planet's residents, they aren't starving, their city isn't underwater, threatened by fire, ravaged by disease, or under military rule. Their jobs are boring but at least they are safe. That is until an encrypted flash drive falls into their hands. Suddenly their lives are upended and nothing will ever be the same again. 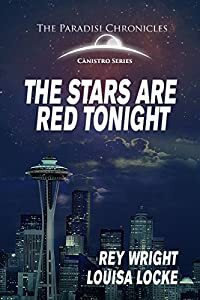 The Stars are Red Tonight is part of the Paradisi Chronicles series, a science fiction adventure through time, space and generations, brought to life through the creativity of multiple authors. In this romantic suspense novella, Rey Wright and Louisa Locke introduce the Kuttners, one of the ten founding families who escape a dying Earth to colonize New Eden, a planet a galaxy away. To discover more thrilling works set in the Paradisi Chronicle series, go to paradisichronicles.wordpress.com.